Akhal-Teke, called "Heavenly Horse" by Chinese emperor in ancient times, is one of the most beautiful and oldest equine breeds in the world. Akhal-Teke is now national horse of Turkmenistan. 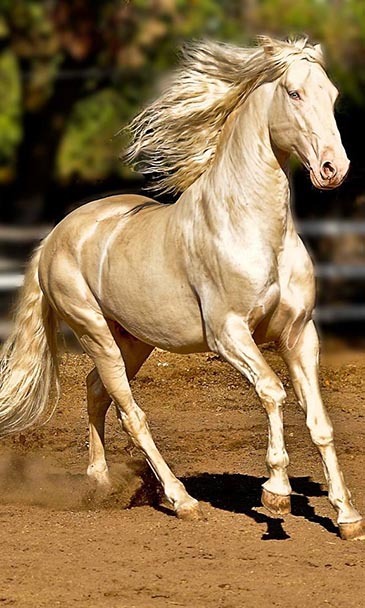 It is often dubbed as "the golden horse of the desert." History says that Akhal-Teke used to be called Fergana Horse favored by the emperors of ancient China. They called the horsed "Celestial (Heavenly) Horses." Fergana Horses were abound originally in Fergana Valley in modern-day Uzbekistan, which is famous for producing Fergana horses. The Chinese emperors so coveted them that they triggered a war to get them. Chinese also called them Dayuanma (大宛馬), meaning horses of Dayuan (大宛) Kingdom, Chinese name for Fergana. Chinese records call them "Sweats Blood Horse (汗血馬), meaning blood sweating horses. The ancient breed of 300 years is widely acclaimed as one of the world's best horse with its athleticism, stamina, speed, agility, and exceptional movement winning admirers. The Akhal Teke first appeared in Turkmenistan, Central Asia, in Kara Kum, a rocky, flat desert surrounded by mountains which played a significant role in preserving the Akhal Teke’s purity. Tribesmen of Turkmenistan first used the horses for raiding and they were selectively bred for speed and agility. Pedigree records were maintained orally by Turkomen tribesmen. In 1881, Turkmenistan became part of the Russian Empire. Russian General Kuropatkin had admired the horses he had seen whilst fighting the Turkomen tribesmen, and founded a breeding farm after the war, renaming the horses “Akhal-Tekes,” after the Teke Turkmen tribe that lived near the Akhal oasis. The Russians printed the first studbook in 1943. Sadly the breed suffered greatly during times of war and at one point only 1,250 horses remained. Historical records show that the Akhal-Teke has had influence on many breeds through trade and war, with stallions often gifted to Heads of State and other influential figures in foreign lands. It is thought that the Byerly Turk, one of the three major foundation stallions of the thoroughbred breed, may have been an Akhal-Teke or Turkoman Horse. Today there is a total world wide population of only about 7000 horses. The largest population is found in Russia with about 700 in their native homeland of Turkmenistan, 1000 across Europe but only 40 or so in the UK. The following are the nine facts about Akhal-Teke. 1. the Akhal-Teke is listed as threatened on the Conservancy’s Conservation Priority List (CPL). 3. An ancient race horse: This rare breed is believed to be at least three thousand years old. Originally called Nisaean, Parthian, as well as other names, the breed was spoken of by Herodotus in his writing and also by the well-known Roman historian, Oppian. A race horse, they were bred for speed, beauty, size, and strength. They are still raced in Turkmenistan. 5. A foundation for the thoroughbred: While many think of the Thoroughbred as an influencer for so many breeds, with the Arabian as its ancestor, evidence suggests that Byerly Turk, one of the three founding stallions of the Thoroughbred breed was an Akhal-Teke. It makes sense if they are one of the world’s oldest and most well-known racing breeds. 6. An extreme endurance animal: The Akhal-Teke comes from a country where resource – food and water – are scarce. The breed naturally developed to survive in these conditions, making them an incredible Endurance horse. In 1935, a group of Turmen riders rode 2500 miles in 84 days. The trip included a three-day, 235 mile, crossing of a desert without water. The breed is known for extremely thin skin, which may have something to do with its desert habitat. 8. Lavishly Decorated: As you can guess by the fact that the breed is their national emblem, the Turkmens take great pride in their Akhal-Tekes. This includes decorating them with lavish tack and drapings. These “alagayysh” are highly-prized and made of gold, silver, bronze and precious stones. 9. An unusual trot: A study being conducted by Phil Case, who brought the breed to America, has shown that the Akhal-Teke’s trot is not the typical two-beat rhythm of other breeds. Instead, they step down with each foot individually – alternating between having just one foot on the ground, to two diagonal feet on the ground. This creates a smoother trot. Further study is still being conducted.